I'm also having a shortening issue. 36 inches is the top of my bare foot. How much do I need to shorten my hoop and how should I do it? your math confused me. where does the 5 come from? or is that a typo. I'd like to make TV 496 so it can button shut like a modern blazer. I really only need one button at the waist. Any ideas on the easiest way to make this modification? I did go ahead and get wet. Helped a lot. Not perfect but better. I used single ply buckram as the hem stiffener in my bell skirt. I have done this before on a previous Bell Skirt and it worked great. But, the buckram I used this time is quite a bit stiffer. I need to loosen it up a bit. Any ideas how? yes, that's what I mean. Thanks! what is my best pattern option for this? The belt is a separate piece. I got that from the auction listing but sadly they don't show the pieces separately. 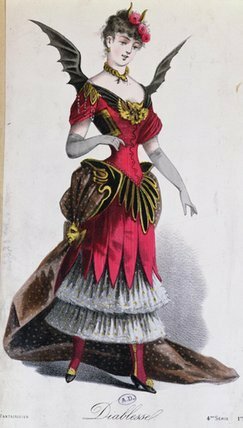 I get confused about tucked in blouses / bodices with bustle dresses. I don't understand how they sit over the bustle without getting bulky. I'm recreating this dress and the blouse is the only part that confuses me. I don't care about the double layer. I think that is there to have a white background for the openwork? If I used a open work piece I'd add a liner to that versus an entire internal. I like the idea of a separate vest I just wonder about the heat factor. thanks again! what I was thinking but it always is helpful to double check. OK! That does sound easy. Is it possible to use the fronts of the TV 416 with the back of TV 490? I like the off the shoulder neckline of TV 416 but I need a bodice that closes in the back and doesn't go over a bustle. Thanks for that shot Frank! Super helpful. I'm not looking to do an exact copy, just to get the gist of it. I need one more fabric element and then I can get to work. Thanks! I like the Hermoine -- I just don't currently own it! But I do have the split pannier one. What about the "arrow" pieces right in the front? I do like those but as I am short I don't know if I can do the side overlays and the arrows.